To prepare dipping sauce, combine orange zest, orange juice, water, honey, 1 tablespoon vinegar, ¼ teaspoon salt and coriander in a small saucepan; bring to a boil. Whisk cornstarch and the remaining 1 teaspoon vinegar in a small bowl until smooth. Add to the saucepan and return to a boil, whisking until thickened, 30 seconds to 1 minute. Remove from the heat. Stir in mint. Sprinkle drumsticks with the remaining ¼ teaspoon salt and pepper. 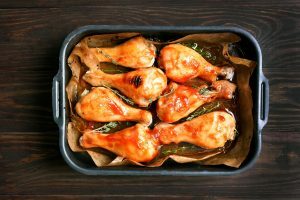 Grill the drumsticks until crispy on all sides and an instant-read thermometer inserted into the thickest part registers 165°F, about 15 minutes total. Serve the drumsticks with the dipping sauce on the side.